The Audubon Center and Sanctuary’s Plant Exchange and Sale is set for Saturday, May 19, from 11 a.m. to 3 p.m. 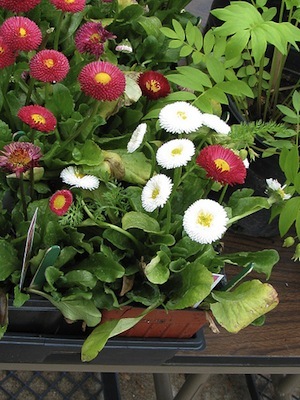 This photograph of English Daisies at a Plant Exchange and Sale won Sarah Siwula a prize in an earlier Audubon Nature Photography Contest. JAMESTOWN – The Audubon Center and Sanctuary is again offering a wonderful event for gardeners. On Saturday, May 19, Audubon’s annual Plant Exchange and Sale provides an opportunity to meet other gardeners, to exchange extra and no-longer-needed plants from your home for others that suit you better, and to support Audubon. It is pretty simple: from 11 a.m. to 3 p.m, just come with plants in pots (no plastic bags) or money, and exchange or buy plants and take them home. Bring in your extras, your volunteers, and seedlings or plants you don’t have room for. Labels including the name of the plant, color (if known), and sun/shade preference are appreciated. Audubon reserves the right to refuse plants, especially invasive species. Plants are priced based on condition, species, and size. Plants donated from nurseries will be cash only. Plants donated by individuals are able to be exchanged. Past years have showcased annuals, perennials, vegetables, house plants and succulents. If you are interested only in donating, plants can be dropped off at the Nature Center on Friday, May 18. If you’re interested in volunteering, Audubon can use volunteers on Friday (May 18) and Saturday (May 19) for repotting, set up, answering questions, and clean-up. The Audubon Center and Sanctuary is at 1600 Riverside Road, off Route 62 between Jamestown and Warren. The Center’s building, with a nature store and exhibits of live fish, reptiles, amphibians and more, is open Monday-Saturday 10 am-4:30 pm, Sundays 1-4:30 pm. Its five miles of trails, Bald Eagle viewing, arboretum and gardens are open dawn to dusk year-round. More information is at www.jamestownaudubon.org. For more information, call (716) 569-2345 or visit jamestownaudubon.org.